If you are a business owner in the midst of an office space expansion, you need to put after builders cleaning on your construction list. When the builders have gone, you all know the enormous amount of dust and debris that remains, therefore it is recommend two sessions entailing an after-builders and a sparkle clean to be performed thereafter any refurbishment or building work. You want your workers to come back into a clean space ready to start working. But, if there is dust and debris on every surface, it will be a slow start. What will the professional cleaners do that a builder’s cleaning team will not? construction debris out and removing the most visible signs of dust. They do not get into the cracks and crevices where the finer dust settles. When they leave, the space is still full of dust and debris. Once you start moving air thorough the space, the dust will come out and settle on everything once again. That is what the professional cleaners can take care of. They can ferret out the finer dust and get rid of it. can get started in paying back your construction costs that much faster. Bringing in professional cleaning teams will let you get back to your business instead of worrying about cleaning up the mess. Leave that work to the ones that do it for a living. It will be one less thing for you to worry about. 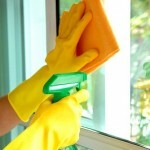 The professional cleaners aim to complete your home to your full satisfaction. You can get back to work and not worry about your customers seeing construction dust everywhere.